PURCHASE | Synconics Technologies Pvt. Ltd.
With procurement rules depending on stock levels, logistic rules, sales orders, forecast manufacturing orders etc. Select different replenishment methods for each product depending on your manufacturing and delivery strategies. 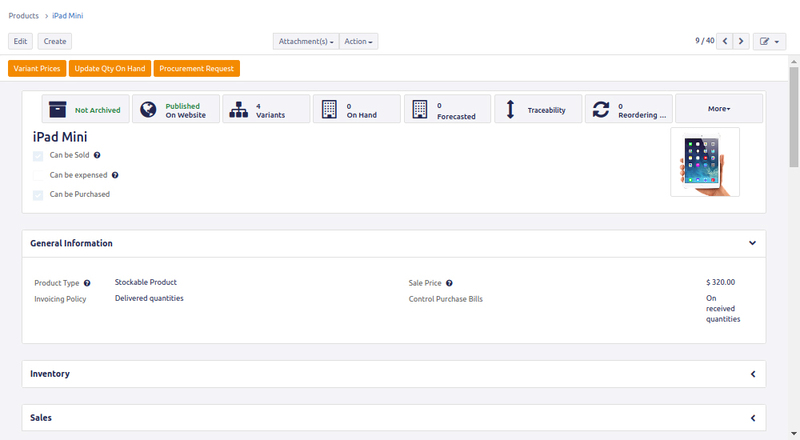 Create RfQs for your suppliers: Configure each product to send out Quotation Request to your suppliers. Send requests through the post or by email: Send RfQs by email directly from the app or print and send them by post, all in just one click. Get offers for multiple items: Send out RfQs for multiple products at the same time. Personalize your message: Add a custom message to your suppliers for each of the RfQs sent. Automate the process: Save time by setting up rules to automatically send RfQs to your suppliers based on your stocks levels. Easily import suppliers' price lists and references to make smarter purchase decisions based on promotions, quantities and special contract conditions. Keep track of a product availability in your supplier’s stock and check your order status from within the app. You can even base your sales price on your supplier's prices. 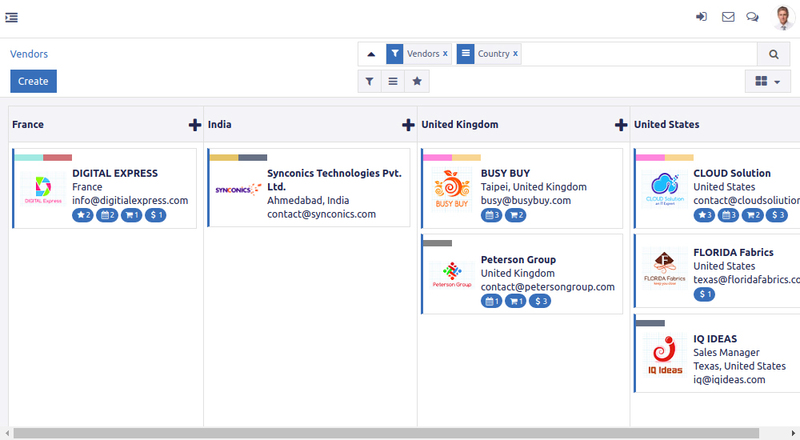 Launch purchase tenders, integrate vendor's answers in the process and compare propositions. Choose the best offer and send purchase orders easily. Use reporting to analyse the quality of your vendors afterwards. Monitor RfQs and orders: Keep track of the status of your quotes and orders: amount of the orders and the expected delivery date. No more generation of draft PO. Auto-complete when generating a draft invoice. Manage incoming products: Keep track of your stock and determine quantity and locations for each batch of items you receive. 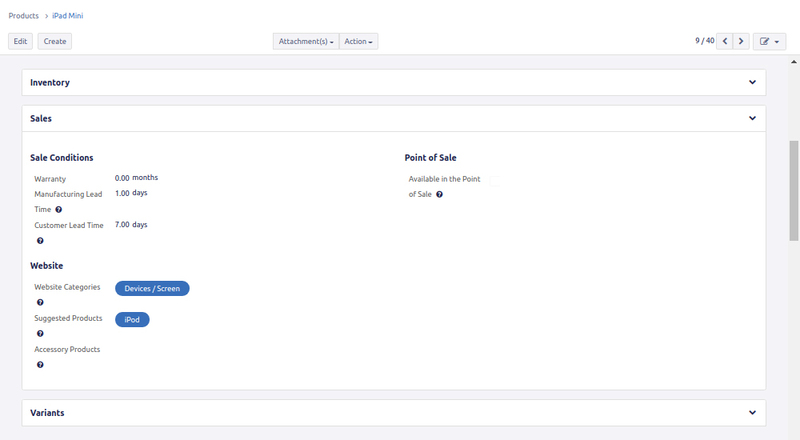 Automate ordering: Set up procurement rules to automatically order the necessary items based on stock levels, minimum quantities per location or per supplier, sales or other parameters. 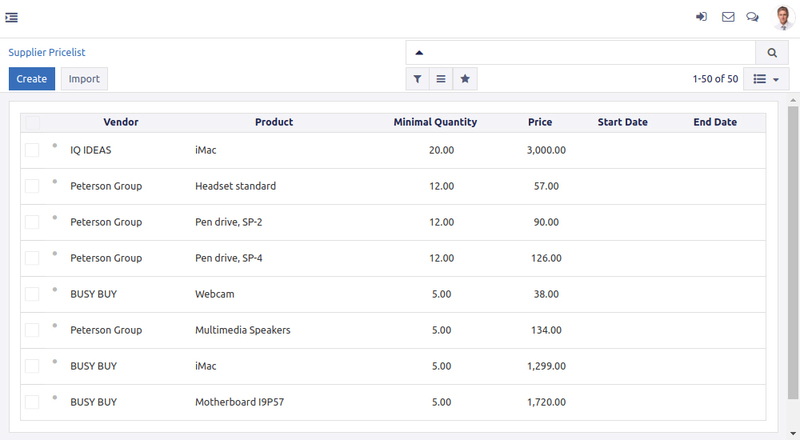 Create products: Define sale price, type, barcode and reference to easily differentiate similar products. Add supplier reference: Add the reference used by each supplier for the item to make it easier to find for both, them and you. 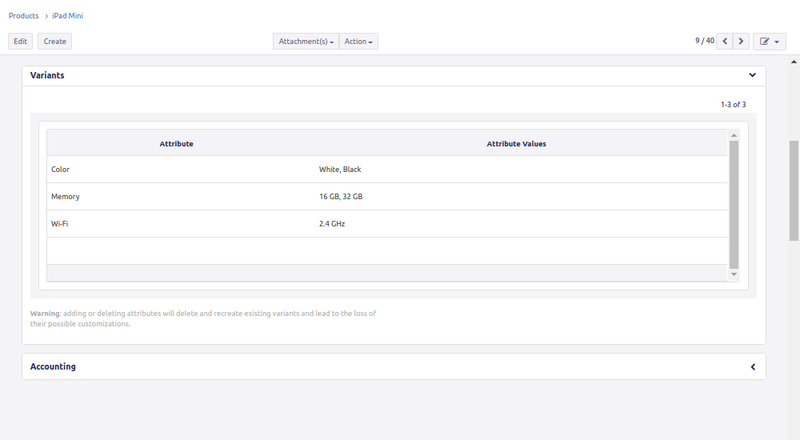 Add product variants: Add variations such as color, memory capacity etc. on the product to allow for a cleaner list of products. Ideal search filters: Search products with the supplier reference on the purchase order. Include accounting rules: Specify your accounting category and define customer and supplier accounts and taxes. Check stock and availability: Keep track of stock, incoming orders and product availability. Specify storage location: Define the product’s exact position within your warehouse. Create sale conditions: Define the length of the warranty and specify customer and manufacturer lead times. Add POS and website specifications: Add specifications to the product for its point of sale or for the website. Define procurement rules: Reference all the suppliers distributing the item, order them by priority and record their delivery time and minimal quantity to save time on new orders. Get statistics on your purchases; Analyze, forecast and efficiently plan your orders. Get accurate statistics on your suppliers' performance through flexible reporting: delivery delays, negotiated discounts on prices, quantities purchased etc. Integrate purchases with analytic accounting to analyze your contracts' profitability. 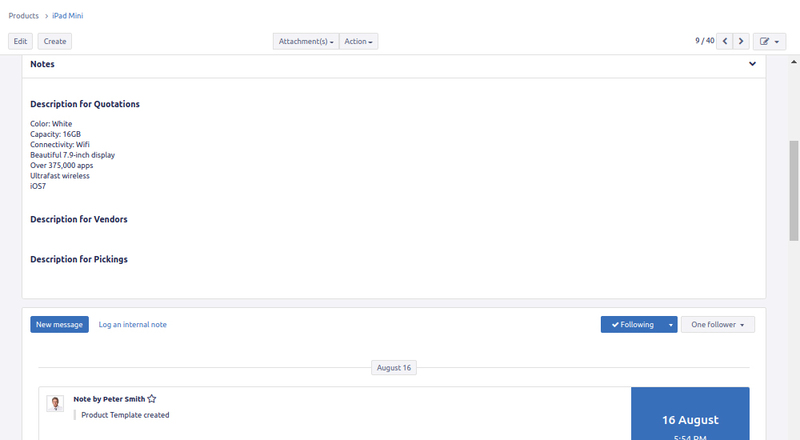 Dashboards: Use predefined dashboards or build your own with the advanced reporting engine Share filters with the team. 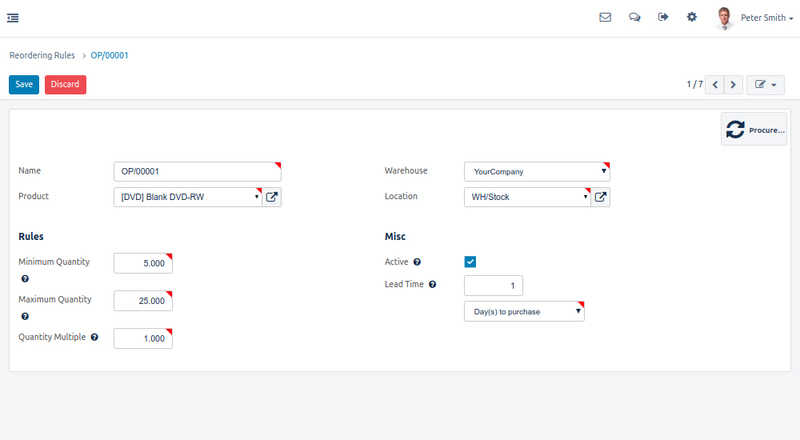 Inventory forecasts: Get forecasts of product availabilities based on confirmed sales orders, purchase orders or manufacturing orders as well as internal moves.